Hortus Camdenensis | Zinnia elegans Jacq. Frost tender, upright, bushy annual with lightly hairy, lance-shaped leaves and daisy-like, broad-petalled purple flower heads in summer. Many colour forms are available. Most garden forms are derived from Zinnia elegans and Z. haageana Reg. To 75cm, taller in some varieties. [RHSE, Hortus]. ‘[Zinnia elegans] is a native of Mexico, and, being a tender annual, can only be raised from seeds, which should be sown in the Spring on a hot-bed, and by the latter-end of May should be set abroad in large pots, or may be planted out in the open border, where from its size and the beauty of its flowers, it will continue to make a conspicuous figure till destroyed by the frost.’ This plant had single, violet-coloured flowers. [BM t.527/1801]. Zinnia hybrida, ‘large-flowered Zinnia’, is also figured, seed having apparently been collected in the wild by Ruiz and Pavon. ‘Communicated by Messrs. Whitley, Brame, and Milne, in August last, under the name of grandiflora; but as we find the same species in the herbarium of A. B. Lambert, Esq. collected in South America by Ruiz and Pavon, under that of hybrida, we have thought it right to adopt this. 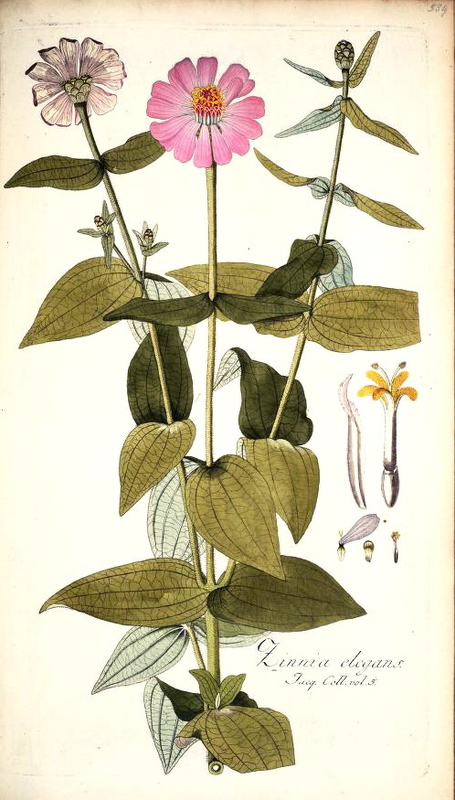 Mr. Whitley received the seeds of this plant from the East Indies, by favour of Mrs. Stuart, but it was most probably introduced there from Brazil. Requires the same treatment as other tender annuals.’ [BM t.2123/1820]. ‘This makes a very pretty bed, and one packet of seed will furnish many varieties. It is a stiff growing plant, about a foot in height. It is a native of Peru.’ [Gard. Chron. 1855], in an article on unusual annuals. Zinnia elegans was introduced to Britain in 1796. [JD]. Paxton's Dictionary lists the varieties coccinea, scarlet, and radiis albis, white, introduced in 1829 and 1832. An advertisement for Wm. Rollinson & Sons in The Gardeners Chronicle offered imported German seed for sale, including ‘12 splendid double varieties’. [Gard. Chron. 1856]. These, or similar varieties, all double, were no doubt among the plants figured in Flore des Serres. [FS f.1394/1858]. Jacq. IPR pl.589/1781-93. Macarthur ordered seed, ‘20 splendid varieties’, from Warner & Warner, Seedsmen and Florists, Cornhill, on 12th April 1846 [MP A2933-1, p.131]. He also ordered seeds of Zinnia elegans coccinea grandiflora from Hurst and McMullen, Seedsmen and Florists of London, on 8th April 1846 [MP A2933-1, p.132ƒ].